Kobe Bryant’s offensive outburst lifts L.A.
LOS ANGELES – Even on a balky knee, Kobe Bryant had no problem giving the Los Angeles Lakers an early leg up in the Western Conference finals. Pau Gasol had 21 points for the top-seeded Lakers, who won their seventh straight playoff game and snapped the Suns’ six-game streak with a phenomenal second half, highlighted by Bryant’s 21-point third quarter following an off-week during which he barely stepped on the Lakers’ practice court to rest his litany of minor injuries. The defending NBA champions beat the third-seeded Suns at their own uptempo game when necessary, fluidly running the court to set up baskets for Bryant in his sixth straight 30-point game. Bryant then rested his sore knee for most of the fourth quarter in the 11th 40-point game of his playoff career. Game 2 is Wednesday night at Staples Center. Amare Stoudemire scored 23 points and Steve Nash had 13 points and 13 assists for the Suns, who hadn’t lost since April 24. Robin Lopez started at center and scored 14 points in his playoff debut, but Phoenix couldn’t keep up with the champs in its first conference finals appearance since 2006. “They’re probably going to continue to be taller than us as the series goes on, so we’ve got to … make everything as tough as possible,” said Nash, whose injured eye didn’t bother him. Both teams swept their second-round series to earn their third postseason date in five years, but the Lakers didn’t allow a week off to affect their remarkable execution. Bryant alternated jumpers and strong drives while Los Angeles pulled away. His 13-for-23 shooting performance included three 3-pointers and 11 free throws with just one miss. 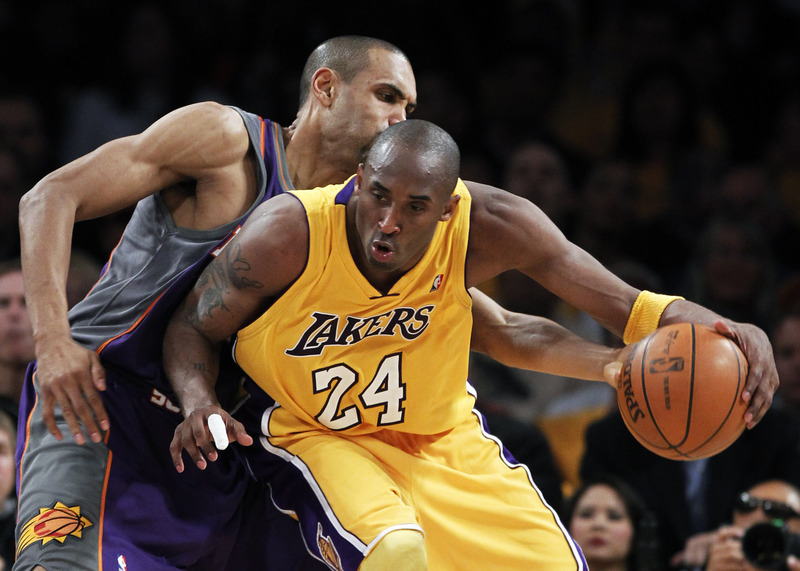 “Kobe carried a lot of the offense tonight, no doubt,” Lakers coach Phil Jackson said. Bryant’s teammates were nearly as impressive despite a game offensive effort by the Suns, who ran into the same height problems faced by Utah and Oklahoma City earlier in the Lakers’ playoff run. Los Angeles made 58 percent of its shots and committed just nine turnovers in Game 1 – its third straight single-digit turnover game – while outrebounding the smaller Suns 42-34.